At the moment, one of the sketches of the painting is in the St. Petersburg Hermitage. The history of its creation is somewhat different from the usual works of Pierre Auguste Renoir. It all started in 1891, when Henri Rougeon, director of the Department of Fine Arts in France, turned to the artist with a request to provide him with a job for a museum in Luxembourg. Then Renoir took up the creation of a number of paintings, aged in one theme. One of these paintings was the work of “Girls for Piano”, which critics considered unfinished. The fact is that the viewer may seem that the picture lacks saturation and drawing of the lines, but it is worth noting the absence of any standards in the work. This and took advantage of Renoir, when provided a picture of the exhibition. If we consider it from the point of view of a professional, there is a certain transparency and weightlessness of the composition that is achieved by the presence of warm, but not caustic colors. Renoir also did not overload the canvas with a clear outline of the figures and the presence of additional attributes. Thus, an impression of a certain integrity of the image is created as a separate episode from life, in which everything is in harmony: the red dress of one of the girls, and the vase with flowers smoothly turning into a musical instrument, and the absence of three-dimensionality. It is important to note that this particular picture was the first in the life of the creator, which was bought for the state assembly. At that time, Renoir turned 50 (!) Years. During its existence, the canvas had time to migrate to the Louvre, then to the national gallery of Gets-de-Pom, and then to the Orsay Museum, where it remains to this day. 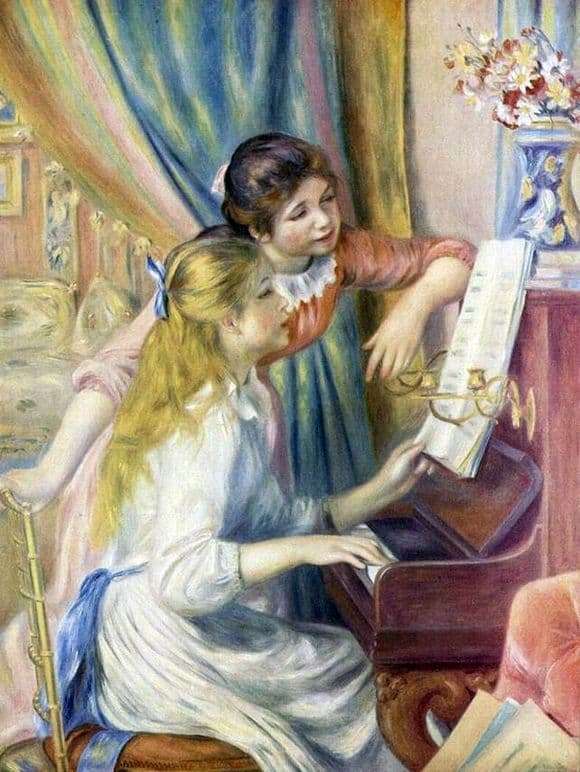 Speaking of the artist, it is worth noting his great popularity among wealthy citizens of that time, since Renoir had a distinctive style of secular France in his works. He painted a lot on a similar topic, including this picture.